The model homes at Homestead, the new master-planned community from Freehold Communities, are quickly coming together! 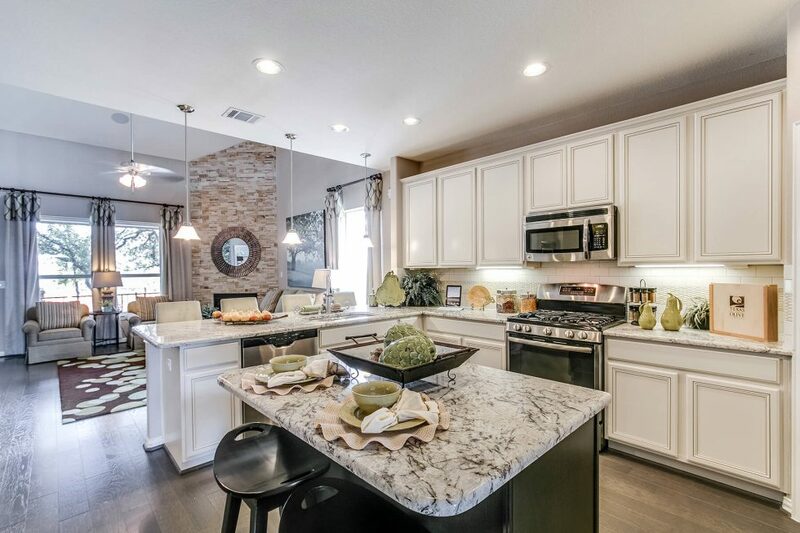 Located in Schertz/Cibolo, just 20 minutes from San Antonio, the community features a wide variety of homes and designs from three distinguished homebuilders, Scott Felder Homes, Pulte Homes and CastleRock Communities. Homes are situated on 55- to 75-foot home sites, and prices start in the low $200,000s. Homestead aims to unite the history of the land with modern-day living. The simple, timeless architecture takes cues from the surrounding landscape, combining rustic materials and modern craftmanship to create homes uniquely tailored to suit today’s lifestyle. Front porches bring neighbors together, and native plantings create a sense of harmony with the environment. Scott Felder Homes, an award-winning homebuilder, offers homes at Homestead that appeal to every lifestyle. A 10-time “Builder of the Year” award winner, Scott Felder Homes has been honored with the prestigious “Volume Builder of the Year” award for four years in a row. At Homestead, homes start in the low $300,000s and range in size from 2,000-3,200 square feet with three to five bedrooms and two to five bathrooms. As one of America’s largest homebuilding companies, Pulte Homes prides itself on creating consumer-inspired homes. Its Life Tested Home Designs® include features like oversized pantries, laundry rooms and office spaces that are carefully designed for modern lifestyles. Home prices start in the low $200,000s with a variety of customization options to choose from. At Homestead, Pulte Homes offers homes that range from 1,500-2,500 square feet with three to four bedrooms and two to three bathrooms. CastleRock Communities doesn’t just build homes, they build a foundation for you and your family to flourish. With an impressive range of customization options, CastleRock Communities works with you to create a home that best suits your lifestyle, needs and budget. At Homestead, CastleRock Communities offers homes starting in the mid $200,000s with three to four bedrooms, two to three bathrooms and ranging in size from 1,600-2,450 square feet. Interested in learning more about the homes and lifestyle at Homestead? Join the Founders Club to always stay up-to-date on Homestead happenings.